"Investigate How Ekweremadu Acquired 32 Choice Properties"
A former Chief Judge of Enugu State, Professor I.A Umezulike, has asked the National Security Adviser (NSA), Brigadier-General Babagana Monguno (retd), to order the Economic and Financial Crimes Commission (EFCC) to probe how Mr. Ike Ekweremadu, Deputy Senate President, acquired 32 choice properties in Nigeria and abroad. The demand for investigation was made in a 16 June 2017 letter addressed to NSA by the retired Chief Judge. 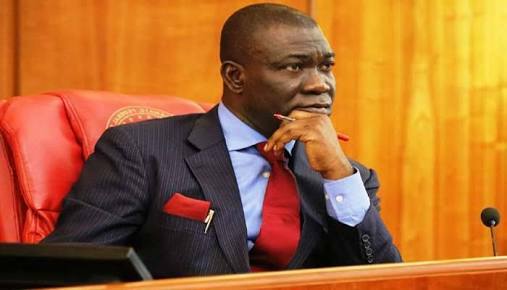 In the letter, exclusively obtained by SR, Professor Umezulike said Mr. Ekweremadu's lifestyle and the properties he has acquired are not justified by this source of income and should be probed under Section 7 (1) (b) of the EFCC Act. According to the retired judge, the EFCC has the power to "cause investigation to be conducted into the properties of any person if appears to the Commission that the person’s lifestyle and extent of the properties are not justified by his source of income”. He noted that Mr. Ekweremadu is in his fourth term as senator representing Enugu West Senatorial District. Before being elected as a senator, said Professor Umezulike, Mr. Ekweremadu spent four years as an aide to former Enugu State governor, Mr Chimaroke Nnamani, first as the Chief of Staff and later, as Secretary to the State Government. "In sum, from 1999 till date, he has been in the realm of public office without any break to engage in any personal business. Thus, his emoluments in the past 18 years are easily ascertainable from Revenue Mobilization Allocation and Fiscal Commission," asserted the retired judge. He equally claimed that prior to his entry into public office in 1999, Mr. Ekweremadu was a struggling lawyer, who lived in a depressed suburb of Enugu at No. 17. Mike Ejeagha Street, Abakpa-Nike, Enugu. "He managed to eke out a living as a 'charge and bail' legal practitioner," said Professor Umezulike, who attached photographs of buildings that housed the Deputy Senate President's law office. Professor Umezulike noted that within a space of 18 years in public office, Mr. Ekweremadu has amassed billions of naira and used part of the money to buy high-end properties across four continents. He added that Mr. Ekweremadu has money in the vaults of Sterling Bank Plc and United Bank of Africa. an a plot at Republic Layout. He also owns 69.4 hectares of land in Ogbeke-Nike, Enugu. Plot 66, 64 Crescents, Gwarimpa Estate. and 52 Ayleston Avenue, NW6 7AB, London. Both properties were subjects of a recent exclusive report by SaharaReporters. In Dubai, as also previously reported by SR, Mr. Ekweremadu is the owner of Room 1903, The Address Hotel, Downtown Dubai; The Address Boulevard, 3901, Dubai; 2 Flats of Burij Side Boulevard (The Signature), Dubai; Emirate Gardens Apartment No. EGG1/1/114, Dubai; Emirate Gardens Apartment No. EGG1/115, Dubai; Apartment No. DFB/12/B 1204, Park Towers, Dubai; Flat 3604, MAG 214, Dubai; and Villa No 148, Maeen1, The Lakes Emirates Hills, Dubai. In Florida, United States of America, the Deputy Senate President owns 4507 Stella Street, Bellavida Estate; 2747 Club Cortile Circle and 2763 Club Cortile Circle, all in Kissime, Florida. "Given the foregoing, we urge and beseech you to direct thorough investigation of these properties of Senator Ike Ekweremadu with a view of bringing him to book and edify the fight against economic and financial crimes in Nigeria," said Professor Umezulike.